Kagura, is a form of Shinto dance. 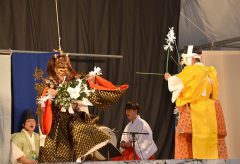 The dances are performed with masks and are practiced around Shimane Prefecture, with the theatrical Iwami Kagura being the most well-known. In contrast to Iwami Kagura, Oki Kagura is old-fashioned and rustic. It was formerly practiced exclusively by professionals called sha-ke who inherited the right to perform. 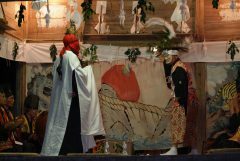 Today the tradition is preserved by local people. 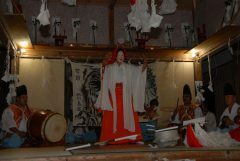 In Oki, Kagura is performed as an offering to Shinto Shrines and to pray for good harvests, good catch, rain, to drive off disease, marine safety and so on. For this reason, miko, or Shrine priestesses, play an important role. Oki Kagura is generally divided into two groups, Oki Dōzen Kagura and Oki Dōgo Kagura, which tell different stories and have different styles. Oki Dōzen Kagura is fast and energetic, and the performance takes place in the center of four tatami-mat-sized stage or upon a boat. 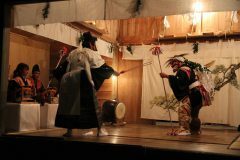 On the other hand, Oki Dōgo Kagura is divided into two main styles, Suki and Ochi, and the performance takes place to slow traditional music and upon a very small stage. Oki Dōzen Kagura Nakanoshima, Nishinoshima and Chiburijima Islands. Performed during the festivals on each island. Features of Oki Dōzen Kagura: 1) Dances retain the appearance of divine possession performed by miko shrine maidens. 2) Dances retain the original style of Izumo Kagura. 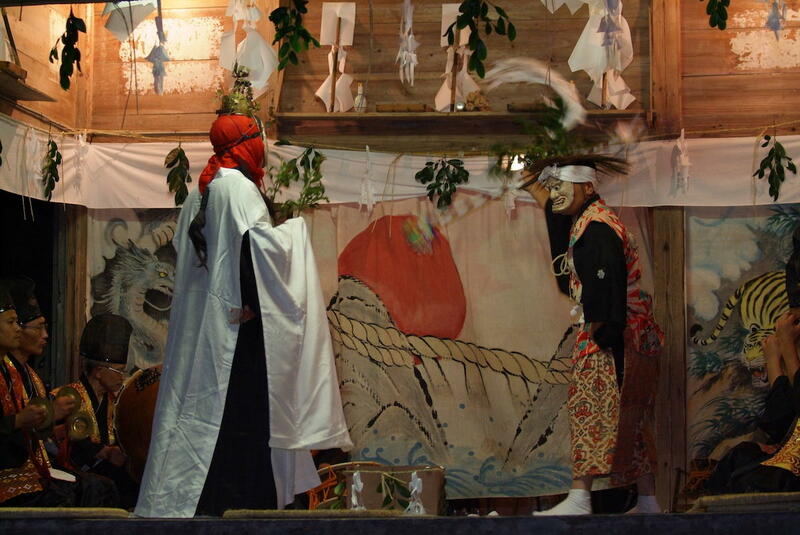 3) Shinto rituals take place alongside the dances. Former Suki Area Kagura. Tōgō Kagura was originally performed seperately in two different areas: Imazu and Tōgō areas. It has preserved the style of the former Suki Region. Intangible Folk Cultural Property of Okinoshima Town. Former Ochi Area Kagura. This style was formerly performed in the Naguchi Area and was revived in 1980 by local people. Former Ochi Area Kagura. This kagura is performed in the Kumi Area, at the annual festival of Ise-no-mikoto Shrine. After the shrine rituals, kagura is performed all night long. Former Ochi Area Kagura. 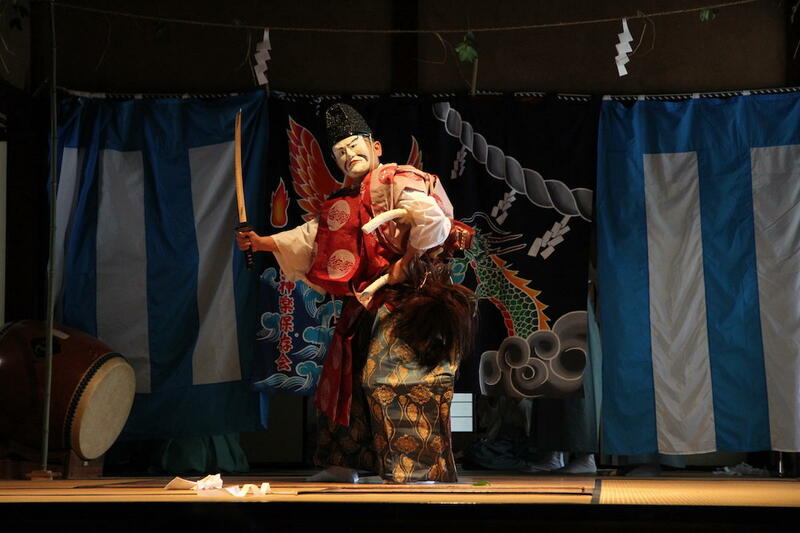 This kagura is performed throughout the night. Former Ochi Area Kagura which decends from Kumi Kagura.